Romano Prodi’s centre left coalition, The Union, has been declared the winner in the Italian elections, despite doubts being cast by outgoing Prime Minister Silvio Berlusconi. The results are good news for the gay community as Signor Prodi has promised to change Italy including introducing a civil partnership law. Official results showed a narrow gap of 49.8% for Signor Prodi’s coalition against Signor Berlusconi’s 49.7% in the lower house, and 158 Senate seats for the left, beating the right’s 156 in the upper house. 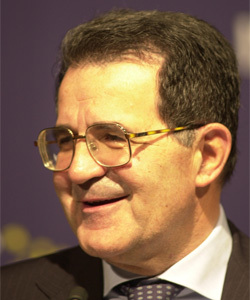 Signor Prodi, a former European Commission President, plans to immediately withdraw troops from Iraq and further European Union integration. His support of gay unions has been criticised by the Vatican and many members of his coalition are Catholics. But one area where he is guaranteed gay support is in a staunchly communist constituency, where the election of transgender MP Vladimir Luxuria is a near certainty. The Refounded Communist Party member has promised to campaign for gay rights as well as support for the economically vulnerable. She has been confronted with homophobia throughout her election campaign, she said: “The same thing had happened in Ardea, but in Guidonia it was a more serious thing. When I got there were some 15 men, including former local councillors for Alleanza Nazionale Cipriani and Lombardo. They pulled out a banner which read “hammer and sickle yesterday, willy and sickle today. “They carried fennel [synonymous of “queer” in Italian] which they threw at me as if they were rocks, I managed to dodge one of these flying fennels right at the very last second, but there was no police in sight. Police got there 45 minutes later”.